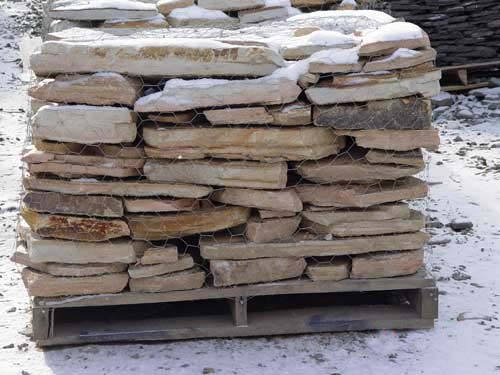 You have come to the right place for the best stone available from our Pennsylvania Fields and Quarries. 12" x 18" x 1" variegated pattern stone by the truck load. This stone has great character it has mixed colors running throughtout the stone. A lot of lue s and greens are mixed right in ready for shipping now. 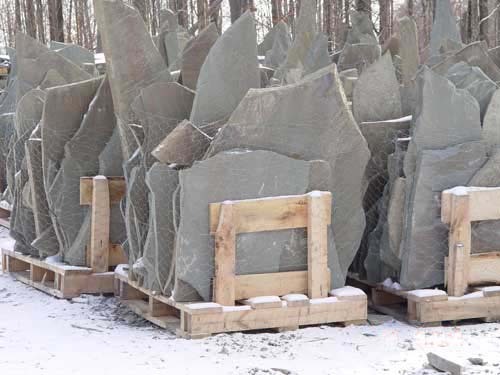 One of this months special deals is this Split Veneer Pennsylvania Blue Stone . 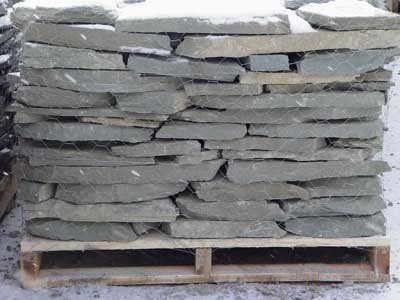 This beautiful Bluestone is pictured in 4 inch thick snapped edge 8 inch wide in various lenghts. 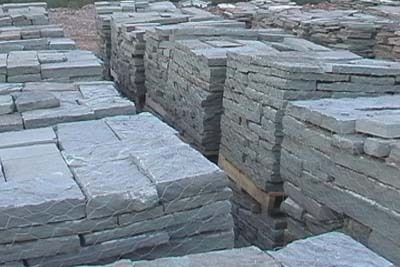 this Pennsylvania bluestone product can be used as veneer , pavers, wallstone or many other uses. We can also custom snap longer lengths such as 3,4 or five foot lenghts as needed. We do consider longer lenghts a special order so plan your lead times. 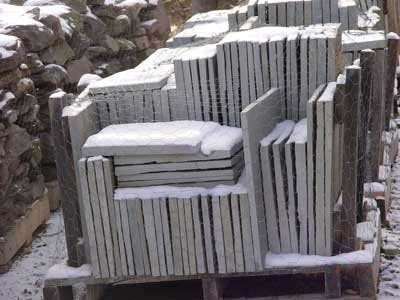 his bluestone comes in three thickness 1"-2" , 2"-4" and 4"-6" . The edges of this stone are guillotined . This means it has the natural snapped edges on four sides and a natural split cleft face on two sides availible by 24 ton shipments. 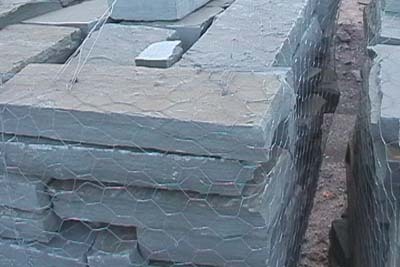 Or you can mix and match our other bluestone products. based on 24 ton full flatbed loads only mix and match sizes. 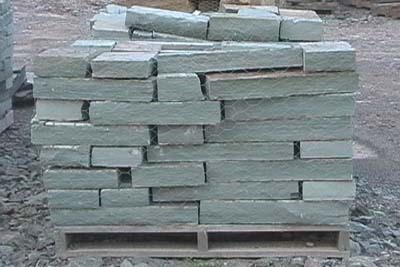 This bluestone stone is excellent for veneer dry stacked wall, masonary walls, retaining walls and even as flagging stone for patios and gardens. 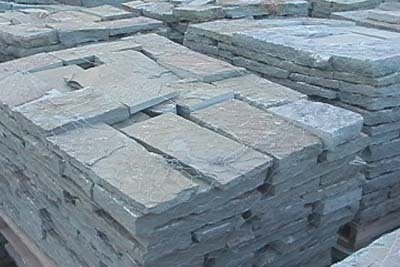 This is a very popular bluestone product so we have step up production of this. based on 24 ton full flatbed loads only. mix and match sizes if you like. All shipments must be paid in full before truck shipment leaves the yard .Shipping is not included. A close up of this stone shows its straight snapped bluestone edge and we mean blue. 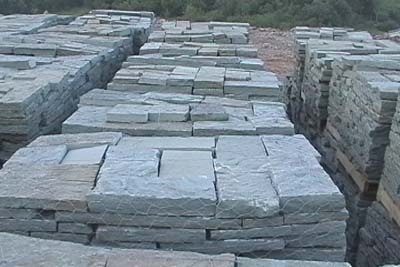 You can use your imagination to see how many projects you could do with this beautiful blue flagstone veneer. This is beautiful stone! to to email us click here or for more information call 570-278-9385* all shipments must be paid in full before truck shipment leaves the yard . Shipping is not included.